Beyond Balance is a volunteer based therapeutic riding center specializing in equestrian activities adapted for people with special needs. A 501(c)3 Organization. Therapeutic Riding has been proven to be helpful to people with special needs in a number of ways. An individual ultimately gains independence and mobility on the back of a horse. Riders that start out completely dependent on a leader and sidewalkers may eventually become independent. Because the movement of the horse is very unique, it moves the rider in a manner similar to the human gait, riders often show improvement in flexibility, balance and strength. The interaction with a live animal can reach psyches that may otherwise be locked away. 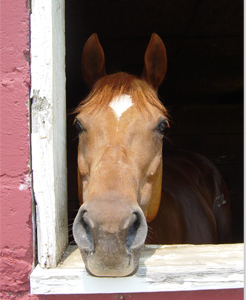 The horse helps to facilitate directions given and can help the participant associate words with actions. These benefits often cross over into their non-horse lives too, with an increased ability to perform daily tasks. Anyone can strive to achieve a partnership with the horse, whether a person has a disability or just wants to form a bond with an animal. Beyond Balance operates out of Morning Mist Farm a privately owned facility. The owners of the facility have generously let Beyond Balance board our horses and teach our classes at the farm. We are grateful for the opportunity to use this wonderful piece of property. As a reminder, please always call ahead if you are planning a visit out to Beyond Balance to ensure that a Beyond Balance Staff member can meet with you. The owners and other boarders cannot answer your questions. Thank you and we look forward to you joining our team. Taking new students for our winter and spring sessions! Thank you to everyone who made Beyond Balance's 11th year a huge success! Please consider Beyond Balance when making your 2018 donations! We are looking to grow our team! If you are interested in being a board member, helping us with our website or just want to volunteer contact us. We have a position to fit your volunteering needs!